Check out these two bouncing babes! What is the only thing cuter than a joyful baby bouncing around in her jumping-seat? Her adorable Border collie pup bouncing along with her, of course! 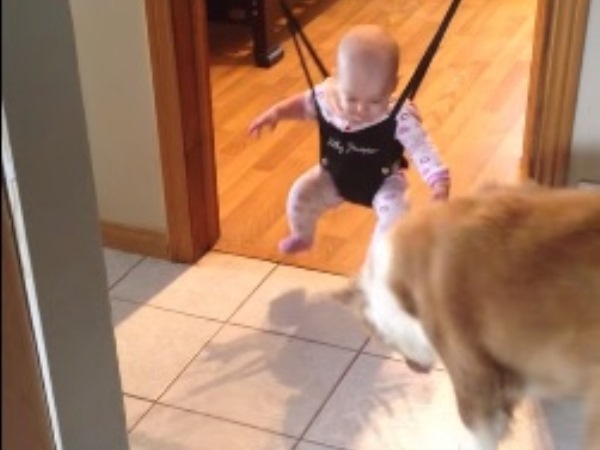 Baby Alexis’ mom uploaded this cute video of her daughter and the family’s dog. In it Alexis learns how to use her bouncing chair, while Daykota the dog jumps along and tries to catch Alexis’ shadow.